Jurassic Park is the latest branded video slot from Microgaming, developed with Universal Studios and Amblin Entertainment. Themed on the 1993 science fiction movie of the same name, the game comes with five reels and 243 ways to win, while featuring high-end graphics, realistic sound effects and playing sequences from the original motion picture. T-Rex Alert and a plethora of Free Spins round only add to the excitement. The 243 Way Wins scheme has become a fixture in Microgaming’s slot releases so you are probably acquainted with the concept by now. 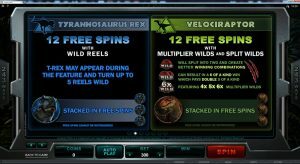 For those of you new to the industry, this basically means that matching symbols form a winning combination on adjacent reels, regardless of their position, rather than on predetermined paylines.Jurassic Park online slot Logo assumes the role of Wild symbol, with its main objective to complete wins by substituting for regular game icons except for Scatter. The good news is Wild appears stacked in the base game, which means it will cover all three positions of the reel it appears on. Mosquito fossil in amber is Scatter and it is this symbol that unlocks all those special features that have been mentioned. Minimum wager is fixed at 30 coins per spin, but that is a small price to pay for having access to the 243 Way Wins feature. Players can further increase their total bet by staking 1-10 coins per imaginary payline or up to 300 credits per spin. Meanwhile, there are three available coin denominations, $0.01, $0.02 and $0.05, with maximum wager standing at $15.With the game’s bonus rounds offering excellent value for money, we are not that surprised that base game payouts are not in the upper half of the market. But, given that the maximum coin jackpot is no less than 8,000, you will still be able to turn a nice profit should you be so lucky as to receive five Jurassic Park Logo Wilds anywhere on adjacent reels. If you have watched the 1993 film, then you will know all about the game symbols appearing in Jurassic Park video slot, which include Dr. Alan Grant, Dr. Ellie Sattler, Ian Malcolm, John Hammond, Tyrannousaurus Rex, Velociraptor, Triceratops, Brachiosaurus and Dilophosaurus, in addition to Jurassic Park logo and mosquito fossil in amber.Obtain at least three Scatters in any position and you will unlock the Free Spins mode. A total of 12 free games will played with one of the following special features. Players can get access to Wild Reels, Multiplier Wilds & Split Wilds, Running Wilds, Mystery Multiplier or Winning Wilds. After playing the Free Spins for 25 times, the player will be able to choose one of the five features rather than being awarded at random. Spot a T-Rex on the game screen and T-Rex Alert will be activated. Alert mode is played for 6 paying spins with 35 Extra Wilds added to the reels and regular Wilds Stacked on all reels. If you have enjoyed the movie, chances are you will fall in love with Microgaming’s video slot that places the main characters into a new setting. Excellent sound effects and great animations make for an exciting game play, which is further enhanced by the presence of high-value bonus games and Free Spins rounds. With that in mind, there is a good chance online gamers will turn a profit as well while having a highly entertaining time at the reels.